If you have split up from a long-term relationship, friends and family will often ask if you want to get back together with your Ex. Whatever happened with your last partner, whether it was a rollercoaster ride from hell or a happy relationship, you may not want to give away too many details. People don’t need to know that you were tired of your boyfriend farting in his sleep or the other inane details of why the relationship broke down. When you share your intimate relationship details with a nosy Aunt Nelly or the office gossip, there is a pretty good chance people will be having a laugh and discussing your private life. 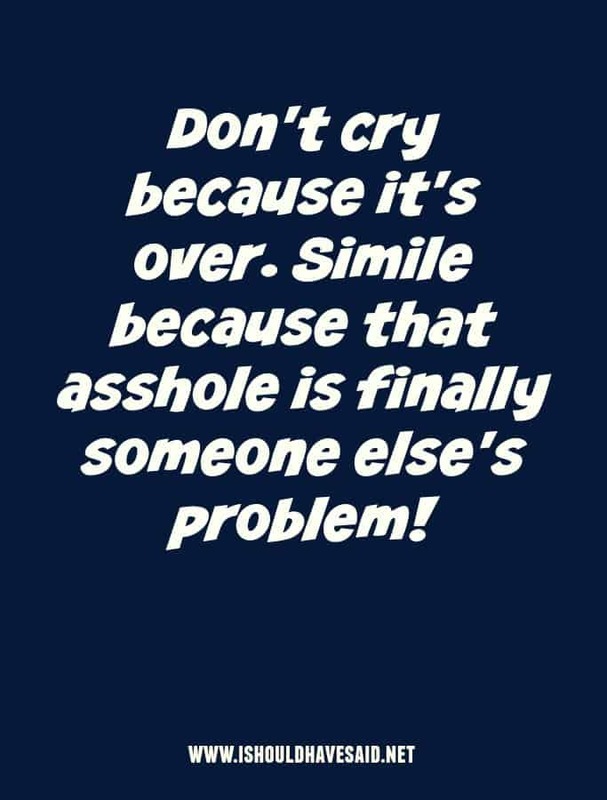 Don’t tell anyone you’re problems. Eighty percent of the people don’t care and twenty percent of the people are glad that you have them. 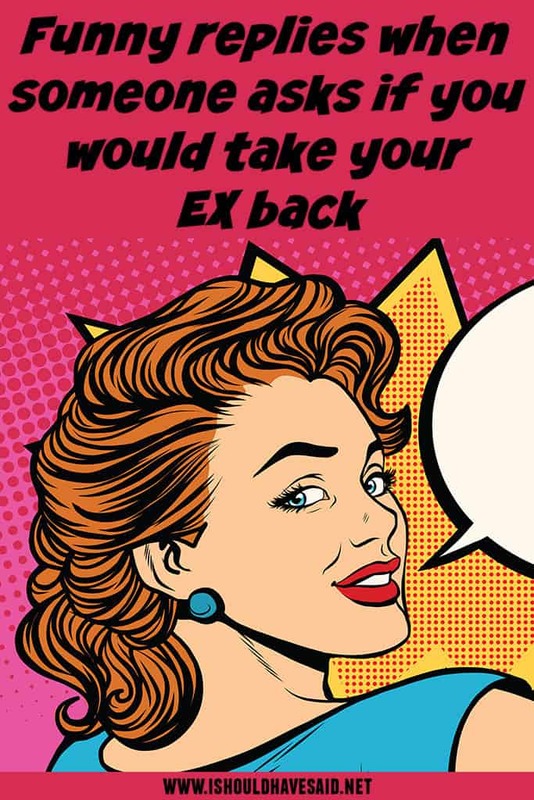 Next time someone asks if you would take you’re Ex back, use one of our clever comebacks that let people know that you’ve moved on, but aren’t going to share the juicy details of the break-up. If your ex wanted you back, would you go? I wouldn't go back to my ex even if her parole officer okay'd it. I would never go back to my ex. It's like reading the same book over and over again when you know how the story ends. 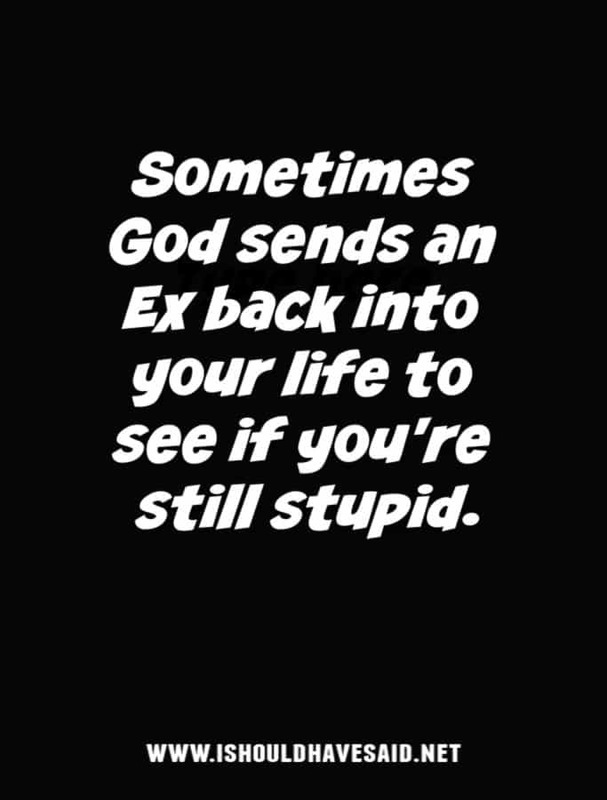 Taking your ex back is like going to a garage sale and buying back your own crap! I still miss my ex, but my aim is getting better. When the past calls, I let it go to voicemail. It’s got nothing new to say. When Sandra Bullock was blindsided by her Ex Jessie James’ infidelity she didn’t trash talk him in the media. She went into hiding and waited for the storm to pass. 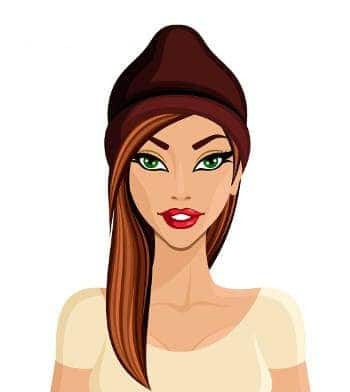 Sandra later shared that she devastated by the break-up and the media drama that ensued, but she had to put one foot in front of the other and get through it. You don’t think it will pass when you’re in the middle of it, but it does. Sandra is a great example of handling a break up with dignity.